This soccer passing drill will help you focus and teach a young player how to pass with the correct surface on the foot, how to receive a ball and move after receiving the pass. Create a 20X20 yard grid (you can change the size of the grid based on the number of players). Organize the players into groups of two. Each group of two should only pass to their partner while moving around the grid. Each player should be instructed to pass and receive with the inside of the foot. Make sure the receiving player moves his body behind the path of the ball when receiving. 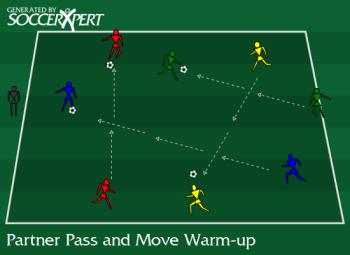 Make sure the players move after making the pass to their partner. Make sure the players are putting the right amount of weight and pace on each pass. Restrict the number of touches.